When the foreclosure scandal erupted last fall, Naked Capitalism was all over it. 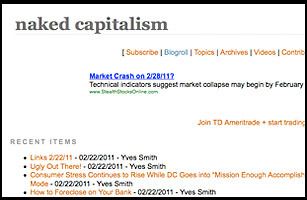 Long before most of us understood what was going on or the implications of it, Yves Smith, the pseudonymous author of the blog, had long posts explaining in depth how the banks had got themselves into the mess, and just how big that mess was, not only for the banks but for the economy in general. As the name of the blog suggests, Smith understands the underpinnings of our nation's financial system. Naked Capitalism knows our economic moles. And when bankers do something wrong, the blog is there to call them out on it. At times, Naked Capitalism's accusations against Wall Street can be hard to prove. But the blog's sense of right and wrong rings true to me. Smith has argued again and again that the financial crisis was not just a bad mistake of some stupid bankers that didn't understand the risks of subprime credit-default obligations. And it is a road map for making sure the financial crisis that we just went through never happens again. If only more regulators would read Smith's blog, the country would be better for it.